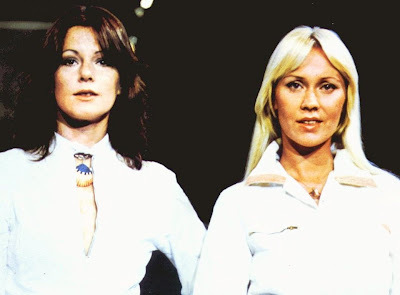 Frida and Agnetha in the Arrival overalls in the autumn of 1976. So why is Frida taller and more pale? I LOOOOOOVE Frida in this one. She has distinction! Can you tell that this picture from - ABBA in Studio 2 / ABBA In Poland - is printed the wrong way round? Reversed negative. It's one of my pet hates, especially if it is a picture on an official release - such as the Waterloo picture disc released in 2004. One of the most famous ABBA shots - in the white hats (Dancing Queen single cover) is almost always printed back to front. So much so, this has now become the official way round. Richard I dislike that as much as you do and I actually flipped this and reversed it before posting and I simply can't figure this one out. Just now I flipped it again on my pc and I am just not sure. Agnetha looks odd in this one... even turned around. Got it... this is the correct way. Check Agnetha's zipped pocket; it is on her right side. Hmm looks odd to me, like it's flipped, how they'd see themselves in a mirror. But I believe you lol.